Founded by Clelia Angelon, Surya Brasil is a sustainable, cruelty-free beauty brand and lifestyle company. During a trip to the brand's pop-up at the seasonal Holiday Shops at the Winter Village at Bryant Park, I met Clelia, a svelte woman in her 60's with vibrant red hair and a magnetic personality to match, and her lovely daughter Wanda Malhotra, who runs the New York arm of the business. 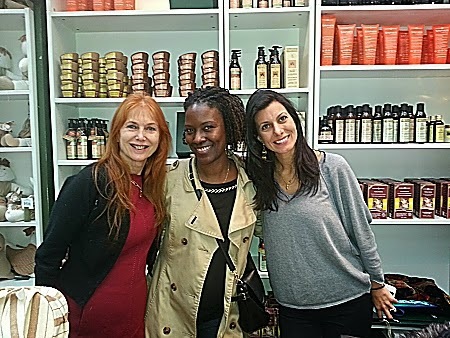 Me with Surya Brasil founders, Clelia Angelon (l) and Wanda Malhotra (r). The company launched in 1995, initially with its staple product, the chemical-free Surya Henna Powder made with raw materials imported from India. The powder is guaranteed to cover your stubborn grays, and its sister product, Surya Henna Cream, is the first hair coloring product with organic ingredients. The mother-daughter team discussed how Surya Brasil is about much more than its eco-beauty products. It signifies a mindset and lifestyle. Clelia is vegetarian, a staunch animal welfare advocate, and she started a music program that helps underprivileged teens in her native Sao Paulo. "One thing leads to another…food, my way of thinking, my yoga and meditation practices, contact with nature …it's all part of a lifestyle that I wanted to apply at Surya," she says. Surya Brasil products are good for you and the environment./Photos by Everything She Wants. Other popular Surya products include the gluten-and-synthetic fragrance-free Sapien Women and Sapien Men lines, and the Amazonia Preciosa line, enriched with essential oil from the Preciosa tree, acai and other exotic organic ingredients sustainably-harvested from the Amazon Rainforest. 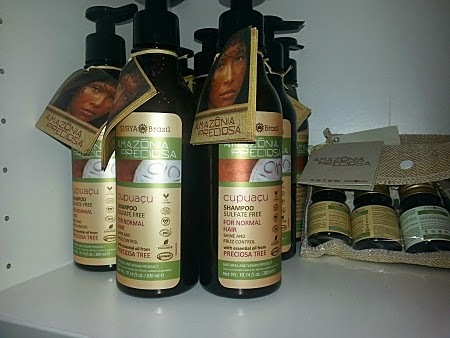 A perfect gift for the holidays or anytime, Surya Brasil's Amazonia Preciosa Gift Set ($38) includes sulfate-free shampoo, conditioner, exfoliating shower gel with passion fruit, buriti oil and acai grains, and a moisturizing hand and body lotion made with macadamia nut. 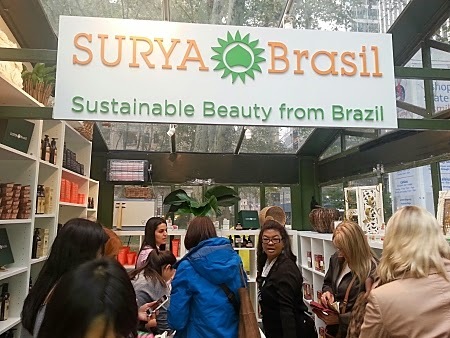 All products are available online and at Surya Brasil's shop in Bryant Park, which is open through January 4, 2015. Guests at the pop-up receive complimentary hand warming massages, natural hair color consultations and delish vegan treats from Vegan Divas.